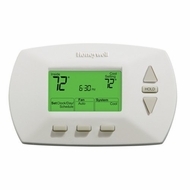 The Honeywell 5-1-1 day programmable thermostat provides scheduling options for weekdays/Saturday/Sunday and can save you up to 33% off your energy bill. You set it up to adjust the temperature when you are away or asleep--times when you don't necessarily need to heat or cool your home to optimum comfort--and your heating and cooling equipment runs less. The RET95E0D features a green backlit display with simplified programming and easy-to-follow text instead of symbols. Exclusive Honeywell Smart Response Technology continually adjusts the pre-heating/cooling of your home so you are comfortable at your programmed times. It also automatically determines if your home needs heating or cooling to provide maximum comfort. Universal compatibility--works with virtually all system types.